On our D Day Landings guided tour we visit sites important to the invasion on 6th June 1944, including the beautiful American cemetery situated above Omaha beach. On the first day of the battlefield tour we visit Ranville Cemetery, where many British soldiers of the Parachute Regiment who were killed during the first hours of D Day are buried. Amongst the men buried in the cemetery, is a heart-warming story of the courage and devotion between a war dog and his handler. This is possibly the only example of a dog being buried with his handler in any CWGC cemetery which makes this site a particularly poignant stop on our D Day tour. 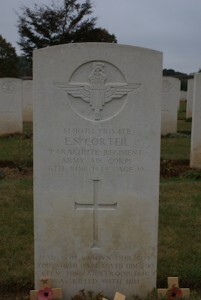 Private Emile Corteil was from Watford in Hertfordshire and served with A Company, 9th (Essex) Parachute Battalion. 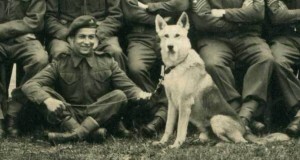 Corteil was the dog handler for the company, and his dog was called Glen. Both Emile and Glen parachuted into France with their company on D Day. Many dogs parachuted in with the invasion force to render aid as scouts, guard dogs and also to search out the wounded. The War Office had begun an experimental dog training school in 1940 after persistent requests by officers and dog trainers. At the end of the First World War, the War Dog School which had trained thousands of dogs was shut down as it was expected that if another war was to break out, technology would have advanced enough to make using dogs superfluous. A Volunteer Trained Dog Reserve was begun in early in the Second World War by those who could see the potential of using dogs, to act as a register of owners and dogs who would, in the event of a national emergency relinquish their dogs. It is likely that Glen’s role would have been to act as a patrol to search the area around his company and to alert them of enemy soldiers in the area. Dogs like Glen would have their own parachute and when they reached the ground they would be released from the parachute by their handlers, their harness being adjusted for work in the field. Had you known our boy you would have loved him too. Glen his parachute dog was killed with him.